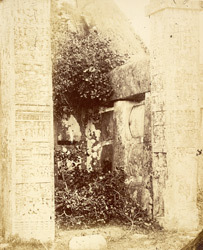 Photograph of the pillars of the northern torana or gateway of the stupa of Sanchi, from the left, taken by James Waterhouse in 1861. The great stupa of Sanchi is the most important surviving monument of the Shunga era (c.185-75 BC). It consists of a large hemispherical dome which was built over an already existing stupa ascribed to the 3rd century BC from the time of the Buddhist emperor Ashoka (c.269-232 BC). Four elaborately carved gateways were added to the stupa during the 1st century BC. The northen torana consists of two square posts crowned with a group of four elephants and two shalabhanjika, females figures grasping the branch of a tree. These support a triple architrave with scrolled ends. The gateway is completely covered of sculptures depicting various episodes of the life of Buddha Shakyamuni.